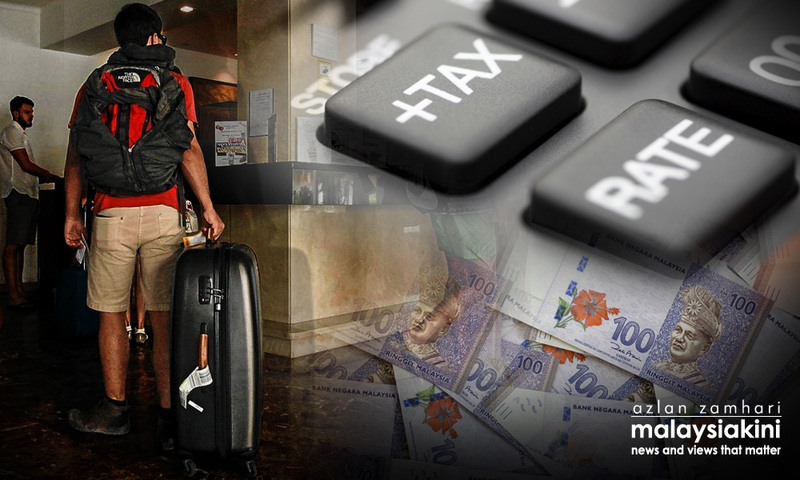 Suara Sarawak: What is Tourism Tax all about? KINIGUIDE | The planned introduction of Tourism Tax on top of the existing six percent goods and services tax (GST) has raised concerns from local industry players and stakeholders. Tourism and Culture Minister Mohamed Nazri Aziz had from day one defended the move which was introduced with the passing of the Tourism Tax Bill 2017 in the last Parliament session. In the process, he got into a war of words with a state minister who argued for the deferment of the tax in Sarawak and Sabah, arguing on grounds of the states’ autonomy. Some parties also insisted that the new tax had caught stakeholders by surprise, prompting Nazri to promise extra incentives to cushion its effects. Malaysiakini takes a closer look at the debates surrounding the issue. In simple terms, the Tourism Tax is an additional charge imposed on customers for hotel rooms. The addition is on top of the existing 10 percent service charge and six percent GST set on room rates. The Royal Malaysian Customs had said that the Tourism Tax charge will be based on the rating of the accommodation - from five star to unrated. How much more will a guest have to pay? Hold on. How did the 'orchids' come into the picture? Aside from the internationally recognised star system for hotel rooms, the Tourism and Culture Ministry has also introduced the orchid rating as a classification system for budget accommodation premises which do not meet the requirements of the Star Classification Scheme. What is the number of rooms we are looking at? The latest data available from the MyTourismData portal of the Tourism Malaysia website stated that there are 4,799 hotels and 304,721 rooms in the country as of 2015. The figure would be exponentially larger taking into account the mushrooming of Airbnb concept rooms and homestays. Nazri had recently said that Airbnb premises with six rooms and more will be required to charge the Tourism Tax. When is the tax supposed to be implemented? In short, Aug 1. But there were some confusions on this matter. In what appears to be the first announcement after the Tourism Tax Bill 2017 was passed, the Royal Customs Department in a circular dated June 6 had said the tax will come into effect on Aug 1. A local Chinese-daily, however, reported on June 7 that the decision was retracted because the Tourism Tax Bill had supposedly yet to be signed by Yang di-Pertuan Agong Sultan Muhammad V and hence hasn’t been gazetted. Nazri later said this was not true. Instead, he said obtaining the Agong’s signature to gazette a new law was only a formality and the government will stick to its original plan which was to start tax collection on July 1. Since then, Nazri had on June 27 reportedly said that the launch of the Tourism Tax will be deferred to Aug 1, as the government was not yet ready to implement it. Who will have to pay? The initial announcement was that the Tourism Tax will be imposed on all guests at all hotel rooms. Following the outcry, it was however announced that exemptions will be given to all Malaysians staying in hotel rooms below four stars. All international tourists will still be subjected to the tax. Aren't the GST and service charge enough? Why the need for more taxes? Again, in short, the Tourism and Culture Ministry has been subjected to annual federal budget cuts and could benefit from added revenue in the form of additional charges. In winding up his debate for the Tourism Tax Bill, Nazri had said revenue from the tax would be in the region of RM654.62 million if the overall occupancy rate for the 11 million "room night" (a unit used in the hospitality industry) in the country can achieve 60 percent. The amount can go as high as RM872.82 million if the occupancy rate reaches 80 percent, he had said. According to Nazri, most of it will go towards promoting the tourism industry through Tourism Malaysia. At a press conference on Thursday, he explained at length on how the Tourism Malaysia annual budget has been slashed to RM110 million, down from RM200 million a decade two decades ago. Over the past three years, he also cited examples of how promotional funds had affected the number of tourist arrivals to Malaysia. How many tourists are we looking at exactly? According to the MyTourismData portal, the figure peaked in 2014 with 27.4 million tourist arrivals and dropped to 25.72 million tourists in 2015. Nazri had said Tourism Malaysia was working on a RM190 million budget in 2014 but the amount was slashed for 2015. Last year saw 26.7 million tourists arrivals and the government has set a target of 31.8 million tourists arrivals for this year. Have all the issues been resolved now? It was reported on June 5 that the state governments of Sarawak and Sabah have reached a common stand to defer the Tourism Tax until a mechanism on its implementation is achieved. Among issues discussed include the portion of the tax collection should be shared equally between Sabah, Sarawak and Peninsular Malaysia. It was also previously reported that prime minister Najib Abdul Razak had met with Sarawak chief minister Abang Johari Openg to discuss the matter. Nazri had also confirmed that establishments, agencies, and associations with valid contracts involving accommodation fees will be exempted the Tourism Tax until the end of their contracts. He said the cut-off date for the tax exemption will be on April 1, 2018, as most of these contracts end on March 31. All new contracts signed after April 1 will have to include the Tourism Tax charge.